It is inconceivable to think rule changes, ostensibly put in place, to increase the profitability of the NFL has dramatically changed professional football since the mid-70s. To be sure, the League will always evolve, but the eco-system put in place in the 2000s have been done with a hatchet instead of a scalpel. Unfortunately, there wasn’t much consideration for preserving athleticism on the field of play. 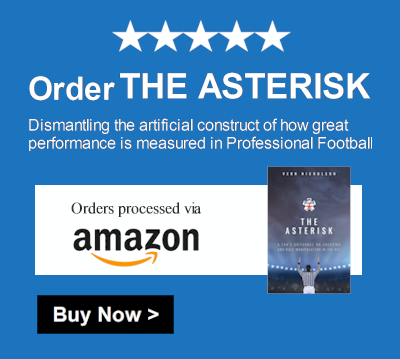 In the new book, ‘The Asterisk’ the author gives a detailed examination of the effects of rules put in place to protect less athletic quarterbacks and the devaluation of true athleticism on the field of play. Protecting one-dimensional, and stationary drop-back quarterbacks have created a ripple effect of the change to every defensive position and a spillover of success for the New England Patriots’ system. The book re-imagines the sport evolving around more mobile and athletic quarterbacks to preserve the excitement of the sport exhibited on the college level. The blame is placed squarely on Roger Goodell’s shoulders, as fans become increasingly impatient with the litany of rules limiting the wholesome enjoyment of the sport. The author devotes an entire chapter on Pittsburgh Steelers’ tight end catch and then no-catch on December 17, 2017, against the New England Patriots. The Asterisk book is available on Amazon.com, Google Play and will be available at Barnes & Noble during the upcoming football season.